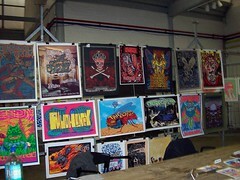 We had a great time at Zstock at Tilburg in The Netherlands & Flatstock in Hamburg Germany at Reeperbahn 2008. We met tons of great people on both sides of the tables.. too much fun.. and traveling europe was inspiring. Click below for Dina's pics from the trip..